G Vusion 2 Blogger Template is stylish theme that make your blog awesome and attractive with professional design. 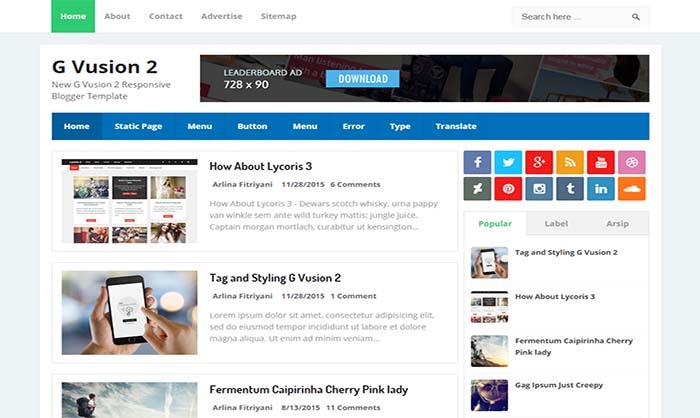 it has two columns layout to display your content and tabbed sidebar widgets, where you can put your popular, recent and most recent comments or you can add different type of social sharing buttons. If you’re looking for one user friendly and fast loading blogspot template then this is one of the best choice for your blog because its design is very simple and professional and one of the biggest advantage of using this template that it will load your articles, images and all blog content with super and amazing speed.